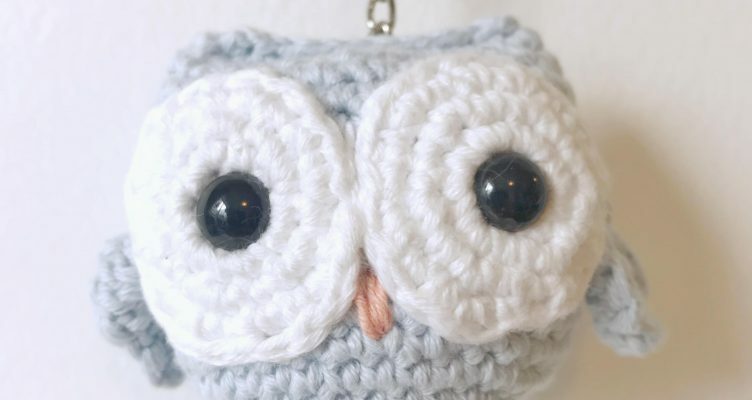 This owl amigurumi is quick to make and will bring a smile to the receiver! 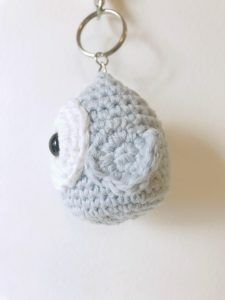 The pattern works up nicely with La Mia Cottony and adding a keychain would make a great gift. Make a few owls and then turn them into a mobile for a nice hanging decoration for a nursery. 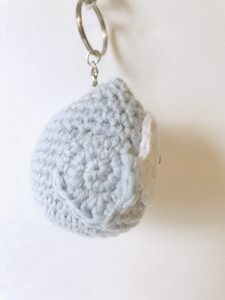 I made this on a whim back in the early 2000 while making a mini hat for one of my amigurumi. I turned the hat upside down and thought it would be a great base for an owl. I hope you enjoy the pattern as much as I do! Please be sure to tag me on Instagram @anniegurumi so I can see your owls. Add the animal eyes through the white circle eyes you made earlier between R12-13 on the body of the owl and secure. Then sew the white eye circles securely onto the body of the owl. Add the second eye in the same matter, ensuring the white portions of both eyes are touching. Using the peachy orange, embroider a beak. *Stuff your owl and flatten to work sc through both sides. Using a few sl st to move your stitch so you start at the right edge of the owls head if it’s not there already. Pinch the ears into a point. 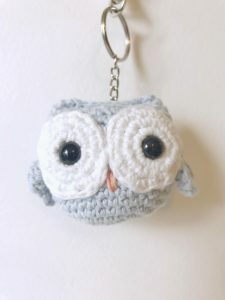 Add a keychain if you prefer using the long tail from the owl’s body. secure well. R3: (3dc in first st), sc in next, (3 dc in next st), sc in next. Leave remaining stitches unworked. Sew wings on the side of the owl. Fasten in all ends. Hope you enjoyed my owl pattern! Please check out my youtube video tutorial for reference if you should need it. 🙂 Thank you so much and please tag me if you make your own owl. You can find me on instagram, Facebook and my patterns on etsy.